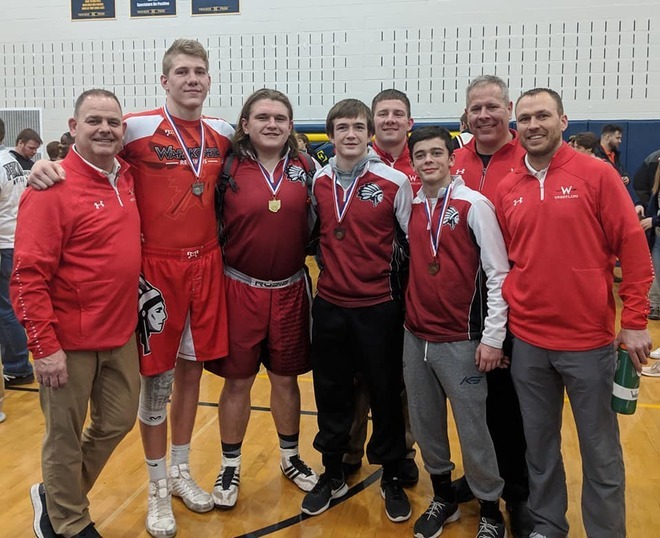 Norwalk, OH- A trio of Redskin Seniors and a Sophomore all qualified for the OHSAA State Wrestling Tournament with their top four finsihes at the D2 Norwalk District. Luke Beach (138), Trevor Plaugher (195), and Brenan Knueve (285) all continued their Senior season with their performances. They will be joined by Sophomore Colin Mellott at Ohio State's Schottenstein Center for first round action on Thursday. Mellott, Beach, and Plaugher are all making thier first trip to Columbus. Knueve is making his second. Team wise, the Redskins finished in 8th place. Mellott (39-6), who finished Runner-up at the Sectional Tournament, opened up Friday with a first period Pin of Bay's Stephen Tepper. In his Quarterfinal match, he dropped a 10-6 decision to Gabe Alda of Bellevue. Alda was a State Qualifier last season. In his first consolation match, Mellott pinned Eric Sadler of Brookside, setting up a match with WBL rival Tyler Hisey of Saint Marys. He ended the Roughrider Freshman's season with a second period Pin and earned his way into the "Go-To" match. In that match, Mellott continued his pinning ways by dispatching of Logan Cravatas of Medina Buckeye early in the third period. That victory clinched his State qualification and earned him a rematch with Alda in the finals. Mellot would have to settle for fourth as Alda was again able to defeat, this time 7-2. In his first round State matchup, he square off against Caledonia River Valley Freshman Drake Cemy, who comes in with a 58-2 record. Senior Luke Beach (27-6), who also finished Runner-up at the sectional, won his opening round match against Jaylen Smith of Benedictine with a first period Fall. In the quarters he had returning State qualifer Eian, Sherman of Sandusky and couldn't seem to get his offense going. He dropped a 12-5 decision to Sherman. On Saturday, the Senior rattled off four consecutive decisions to punch his ticket to State and finish in third. He opened the day with a hard fought 9-5 decision over Jared Weider of Bellevue. Next up was Elida's Bailey Gibson who he also beat by a 9-5 score. In his consolation Semifinal match, he turned in a solid 5-0 victory over Vermillion's Jacob Koleszar. Like Mellott, that win set up a finals rematch. This time, however, Beach was able to make some adjustments and turn the tables on Sherman with an impressive 5-4 decision. Van Wert's Gabe Steyer, who defeated Beach in the Sectional finals, was the 138lb District Champion. Beach will face Steubenville's Jacson Muldrew. Muldrew is a two-time State placer and heads to columbus with a 37-6 record. At 195, Senior Trevor Plaugher (32-5) picked right up from his Sectional Championship and opened the tournament strong with a pair of Friday night victories. He opened with a quick 25 second Pin over Blake Herbert of Upper Sandusky. He followed that performance with an 11-2 Major Decision over Nick Hickman of Keystone. Advancing to the Semifinals, Plaugher knocked off Bellevue's Aiden Nunez 7-3 to advance to the Championship match. That match was against Bay's Matthew Cover, who ifinished third at State in this weight class last year and is predicted by most to win it all this season. Plaugher was up to the challenge, and had opportunities, but came up just short losing a 2-1 decision. Bath's Fileden Deeds also qualified for State with a third place District finish. Plaugher's opening round State opponent will be Junior Brent Paulus (38-8) of Louisville. At Heavyweight, Brenan Knueve (34-1) was lloking to add another District Championship to his one from last year. And he did just that. Knueve opened up Friday with a pair of Pins. In the opener he knocked off Isaiha Gonzalez of Bowling Green in 3:58. The Quarterfinals match didn't take ner that long as he was able to cradle up and put away Holy Name's Josh Tait in just 41 seconds. In the Semifinals, he had as work cut out for him but was able to close it out with a 4-2 decision over Toledo Central Catholic's Jacob Jackson. In the Championship match, Knueve wasted no time in locking up Perkin's Kyler Capizzi and tossing him to his back for a 49 second Pin and his second District Championship. Knueve will face Louisville's Riley Brendle (15-5) in his opener at the Schott. Also competing at the District were Sophomore Jacob Schlesselman and Junior Keaton Elling. Both of them lost thier first two matches and missed qualification but gained some valuable experience to prepare them for next season.